I've always hated those leashes that parents use for their small children. I've silently judged parents who've used them. This was before I had a child, of course, but after having Elijah I was still determined to never use a harness for my child; I didn't want people silently judging me as I had done so many times before. Well, before leaving for our Texas trip, I broke down and bought one. "We'll be flying and airports are busy," I reasoned. My dad had mentioned on more than one occasion, "You should get him one of those harness things." Elijah runs now. He runs fast. It takes a lot of supervision to keep him safe because while Elijah does see, he doesn't see well. With parenthood comes wisdom and I now see the merit in such a product. It's about safety, not about laziness or demeaning a child. 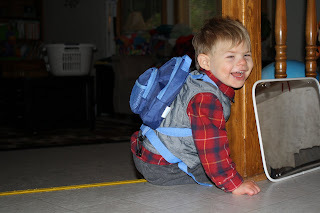 Elijah loved his new backpack harness. He was able to help us by carrying some of his own toys, plus I could hold the handle on the top and give Elijah a sense of freedom. I always hold his hand when we're in public so he thought he was on the loose – and he loved his new found freedom (or at least the perception of it). We hadn't used the harness (which attaches at the bottom of the backpack and isn't visible in these photos) until we got to the airport for our return flight. The airport was busy and it seemed the perfect time to try it out. My parents offered to take Elijah while they took a walk around the airport, which allowed Andy and me to eat our dinner. After a short time my dad came back and told us how a man had come up to him and said, "I suppose you have a cage for him at home too." Yes, someone actually said that to my dad. My dad, without missing a beat, said, "Sir, this boy is almost blind." The man, not knowing what to say, walked away. My mom said firmly and loud enough for the man to hear, "Wow. That was rude!" It wasn't too long before the man came back and apologized. I have to give the guy credit for having the guts to come back. I don't know if I would if I were in a similar situation. My dad, again being fast on his feet, accepted the man's apology and gently chided, "You know, perhaps you should think before you speak." And that was that. 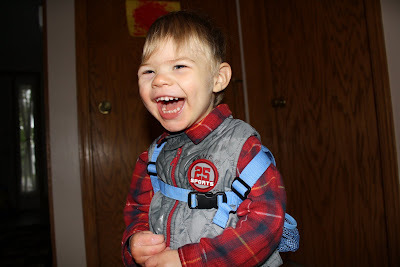 Elijah wore his harness for less than an hour (probably only a half hour) and we were criticized for it. It's no wonder I was apprehensive to use it. I'm not trying to pick on this man, this stranger I'm sure we'll never see again. (Okay, scratch that... I am picking on that man. I can't imagine having the audacity to say that to a complete stranger!). The point is, I think this is a valid lesson for all of us. We're judgmental creatures. I'm as guilty as anyone else. But, if Elijah has taught me anything, it's that you really can't judge someone or something just by looking at them. You cannot look at a person who cannot walk or talk and know their IQ. You can't look at a person and know everything there is to know about them. And you can't look at child wearing a harness and judge their parents (or grandparents). Think before you speak. The advice from Dennis to "think before you speak" is good advice for all of us. Well said Lisa....well said!! you just dont know whats going on behind the scenes. Very well said Lisa, we all should walk a mile in someone else's shoes before we open our mouth to make a judgment. My mom feels the same way about those harnesses. Me: Hello crazy almost deaf, 2 yo on the loose...well I think you know where I stand. It is COMPLETELY a safety issue and some people need to mind their own d@mn business. I have thought of using one in Disneyland. Austin wants to run, but will not HEAR me if I call him back. He already wears a backpack feeding pump so why not a harness for safety. I don't think you should worry about being judged. Although clearly some ignorant people will do so. Better to have Elijah safe. Grandpa sounds like my kinda guy! I think they are a great idea when use properly and in situations like an airport. All too often I see the doting mother too busy on her cell to mind where her kid, only to look up 30sec later and the kids 50 feet away. Thats OK, people think my white cane is a fashion statement, till I walk into them.. and they are the ones complaining *I* should watch where I am going...! I think it is interesting that someone responded so negatively to the harness. I have one for Weston that looks like a monkey on his back... he thinks it is awesome! The only comments I have ever received from using it were positive. And, thank goodness I had it when we went to Disneyworld last year. To me it is a matter of safety. In airports and other crowded places, it is so easy for a fast little kid to run off! I am so shocked that someone said such a rude comment! I also would have been disgusted, but at least he apologized. I like your Dad a lot. Wish I could be that quick with a good response. I'm pretty defensive about my little guy. I remember we were going into a restaraunt once and they told us no strollers inside and while I can be a patient person, I wasn't that day and snapped, He's disabled and can't sit in a high chair. She accepted the response but then lead us down some stairs when there were plenty of booths open that didn't require us to use them.